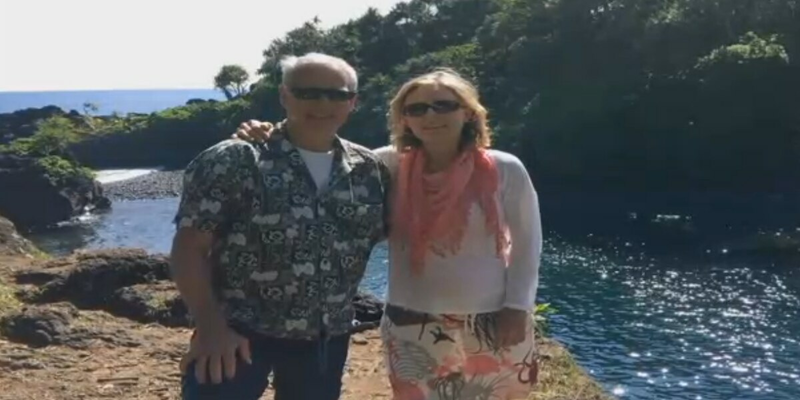 HANA, MAUI (HawaiiNewsNow) - Two visitors from California have spent a lot of time in the hospital since tying the knot on Maui a few months ago. They've been sidelined by rat lungworm disease as the state investigates a growing number of cases. When Ben Manilla, 64, and Eliza Lape, 57, tied the knot in January, they had no idea their vow of remaining faithful in sickness and in health would be put to the test so soon. The newlyweds spent two weeks in the Hana area. Lape's symptoms started before they returned to San Francisco. "My symptoms started growing to feeling like somebody was taking a hot knife and just stabbing me in different parts of my body," she recalled. Manilla, who teaches at the University of California at Berkeley's Graduate School of Journalism, spent a month in the ICU and is still in the hospital undergoing intensive rehabilitation. "I've had several operations, two pneumonias, a blood clot. Right now, I'm dealing with a kidney issue, all of which was spurred by the ratlung," he said. The disease affects the brain and spinal cord. The illness is spread by a parasite that infects rats, which can pass larvae of the worm in their feces. Slugs and snails can become infected by ingesting the larvae. Humans can acquire rat lungworm by eating raw produce containing a small slug or snail, or part of one. Eating contaminated animals, including freshwater shrimp and land crabs, can also lead to infection. The risk of contracting the illness can be reduced by thoroughly inspecting and washing fresh produce. In 2017, there have been six confirmed cases of rat lungworm disease with ties to Maui, according to the Hawaii Department of Health. Four patients are residents and two are visitors. There are also three cases on the Big Island. DOH officials said there were 11 confirmed cases in 2016, all on Hawaii Island. However, the Hawaii Health Information Corporation, an agency that compiles health care data, tallied 22 cases statewide last year. The figure is based on information from emergency rooms and other hospital visits. A DOH spokesperson said HHIC's numbers vary greatly from the department's confirmed cases in recent years. The state plans to look into the methodology and research the source of the information. Experts worry that the rat lungworm disease problem is underreported. "They're just reporting numbers being discharged from hospitals, so they're missing all the other cases where people might go into a clinic and not a hospital," said Susan Jarvi, a professor of pharmaceutical sciences at the University of Hawaii at Hilo. Manilla and Lape aren't sure how they contracted the illness. They just want others to educate themselves and take precautions to avoid a similar ordeal. "Had we known we were walking into this kind of environment, we would have had a completely different attitude," said Lape. "It really does disrupt and destroy people's lives." DOH officials are investigating at least four other possible cases.